NASA officials have cleared Space Shuttle Endeavour for launch on June 13 at 7:17a.m. This mission, the STS-127/2J/A flight, will complete assembly of the Japanese Kibo Laboratory complex during the 16-day journey to space. With this approval for flight comes one of the final steps of flight rationale for Endeavour’s Reusable Solid Rocket Motors (RSRMs) – with Stiffener ring foam loss from STS-125’s right hand SRB taking center stage in the In-Flight Anomaly (IFA) review of the Hubble Mission. The only issue from STS-125’s RSRMs that carried over to STS-127’s FRR process pertained to the loss of Stiffener Ring foam on the right hand (RH) motor. “Stiffener ring foam is missing from several areas of the forward, center, and aft stiffener rings on the aft segment of the RH motor,” notes the SSP FRR document available for download on L2. This type and quantity of stiffener ring foam loss is uncharacteristic of previously observed conditions. Furthermore, evidence from the RSRMs indicates that the majority of the foam loss occurred prior to splashdown in the Atlantic Ocean. The presentation notes that – during post-flight inspections of Atlantis’ RSRMs – there were “sooted” areas of paint around the missing foam areas. Foam loss from splashdown forces would not have sooted the external paint. 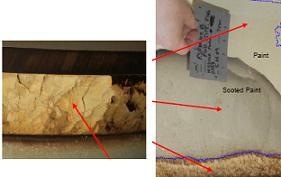 Furthermore, the post-flight inspections also noted adhesive failure at the foam/paint interface. After discovering this issue, engineers initiated a “fault tree approach” which included the use of forensics, chemical sampling, testing, and “thermal-structural analysis” to identify any special causes that could have contributed to the STS-125 RSRM observations. Of these special causes, material, processing, and loads/environment have been identified as potential contributing causes to the abnormal foam loss. With these potential causes in mind, an analysis of future RSRMs is underway to check for any anomalies or abnormalities that may be present. However, these potential failure mechanisms do not reduce the uncertainty of the time of release of the various foam pieces. Nevertheless, the FRR presentation notes that defining the liberation mechanism will help identify root cause and contributing factors to the foam release. This, in turn, will help bind potential release times and the effects this type of foam release could have on future flights. To aid in the determination of the particular time-of-release, NASA analysts conducted a thermo-structural analysis within pre-set bounding assumptions to observe potential release times based on particular failure mechanism. This analysis will also help identify potential issues Endeavour’s RSRM stiffener ring foam could experience during ascent. Furthermore, the analysis of potential release times will help imagery and TPS experts understand the risk posed to Endeavour as RSRM foam can travel ‘up’ the stack via the surrounding slipstream of air during launch – an anomaly that was first noticed during Discovery’s STS-116 launch in December 2006. 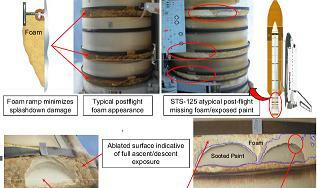 However, all evidence collected to date suggests that the foam liberation on STS-125 occurred after SRB separation. “Evidence from multiple sources indicates that foam release on STS-125 was post booster separation,” notes the SSP FRR documents. There were “multiple events” observed by the SRB engineering cameras at 280-seconds that are still under review to determine if they are the foam releases in question or something else. However, thermo-structural loading, heat flux, and dynamic pressure maximums peak during reentry, lending further evidence that the most likely time of release is/would be during SRB reentry. Likewise, “sideways orientation, tumbling, or aft end first assessed to be worst case for foam liberation,” notes the RSRM FRR document. At this time, there are no indications of material or processing anomalies on STS-127’s motors; however, without root cause identified, it is impossible to say for certain whether or not Endeavour’s RSRMs carry the same conditions as Atlantis’ last month. With this is place, the SSP FRR notes that final flight rationale for STS-127 was still pending as of last week, rationale that was reached today during the SOMD FRR. Lastly, the SSP FRR document notes that the thrust imbalance observed during STS-125 was within all family limits with no issues going into STS-127. For STS-127, one change will be implemented to the Solid Rocket Boosters (SRBs). 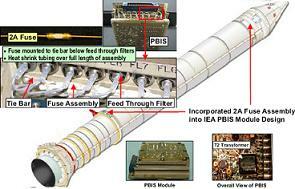 This change relates to the incorporation of a 2A fuse assembly into the Power Bus Isolation Supply (PBIS) module. This change was implemented due to “Integrated Electronic Assembly (IEA) PBIS T2 transformer solder joints susceptibility to fatigue,” notes the SRB FRR document – available for download on L2. The issue was first presented during the STS-124/BI-134 Certification of Flight Readiness/Mission Management Team meeting and the STS-125/BI-135 Flight Readiness Review last year. This 2A fuse incorporation comes one flight earlier than expected due to the availability of forward and aft IEAs with modified PBIS cards. The redesign also eliminates all potential criticality 1R failures downstream of fuse associated with PBIS and mitigates the loss of SRB power bus concerns and prevents loss of redundancy for SRB critical functions. For STS-127, all crew handheld cameras, ground network cameras, SRB cameras, and the ET LO2 Feedline camera are on track to support the June 13th launch. However, there will be two changes to the imagery ability from STS-125. The first change pertains to the Forward Skirt Aft Pointing camera on the LH SRB. This camera will be repositioned to match the orientation of the RH SRB camera from STS-125 and STS-120. This new Forward Skirt Aft Pointing camera configuration – which allows engineers to observe foam behavior in the Intertank region of the ET – has been baselined and approved for the remainder of the Space Shuttle Program. Additionally, one long-range tracking camera will be moved back to Ponce Inlet (just south of Daytona Beach) from its STS-125 support position in Cocoa Beach. Furthermore, Endeavour’s Umbilical Well still camera will be Removed and Replaced (R&R) now that she is at Pad 39A. This R&R is expected to resolve the “no flash” and memory buffer problems experienced during pre-flight testing. Lastly, ET LO2 Feedline camera live downlink through ET/Orbiter separation will be available for all remaining missions due to ISS orbit inclination and launch trajectory.